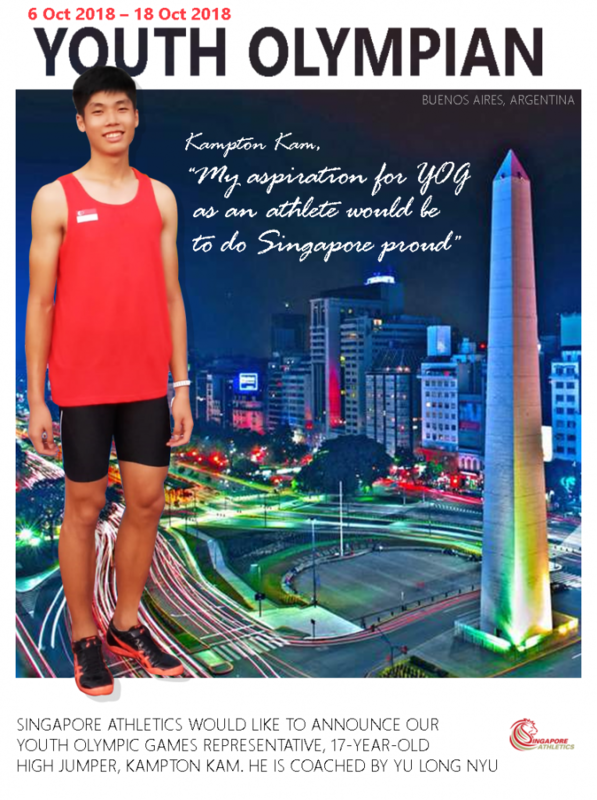 Singapore athletics would like to announce our Youth Olympic Games representative, 17-year-old high jumper Kampton Kam. He is coached by Yu Long Nyu. We would like to wish him all the best for the competition and have a safe journey to and back. When asked, Kampton said, “My aspiration for YOG as an athlete would be to do Singapore proud. A podium finish or new PB would be the icing on the cake. As a youth participant, I look forward to making new friends globally during the Games and learn more about both the local culture & other different nationalities as well. I hope to have fun and broaden my horizons during the YOG where there’s such a strong amalgamation of diverse cultures and passion for many sports”.